The rebooted Scout Network Programme encourages you to achieve awards and experience amazing adventures. Receiving a top award is a fantastic achievement and shows you’re committed to learning new skills and developing your character. When applying for work, your awards are great talking points that help you demonstrate your experience and skills. 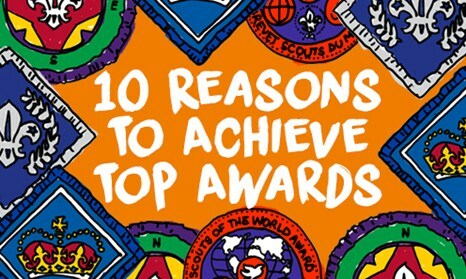 Here are the different awards you can achieve and 10 reasons why you should. The Chief Scout’s Diamond Award is the highest of the Chief Scout’s Awards, and the final step before the Queen’s Scout Award. SOWAencourages you to develop and support society, locally or globally and connect with 50 other national Scout associations. This award is only available to Scout Network. Take part in a 10-day expedition and in one major project outside the UK. Complete the award with a team of peers who you can share the experience with. The Queen’s Scout Award is a fantastic achievement and the highest youth award achievable in Scouting in several countries. Young adults do the most amazing feats and complete tough challenges to achieve QSA. You can directly help make a difference in communities across the UK and around the world by volunteering your time and starting community projects. Along the journey of completing your awards, you will be meeting other members left, right and centre, making friends for life. Employers value project management skills as they are essential to getting task done. Each one of the awards will require you to plan a project which will set you up for future study or jobs. Step out of your comfort zone and immerse yourself into a world of discovery, and conquests! Expand your knowledge on what is happening in the world and on your doorstep. Come up with ideas on how to tackle those issues. Along your journey you will work in collaboration with mentors who will help you achieve your adventure, community and international goals with related skills. Each of the awards requires you to work as part of a team that will help you develop team-working skills. The awards encourage you to take up new sports and you will soon live a healthier and active lifestyle because of the exercise you will be getting. Within the teams you will be working with to achieve your award, there will be opportunity for you step up and take a leadership role. Acquiring leadership skills is important for career progression. Not only will you be learning new skills but you will also be developing the ones you already have. After completing your award you won’t be the same person who started on the journey. All the experiences you will have had will leave a positive impact on your life.